What could an extra 25-100 leads a month do for your small business. 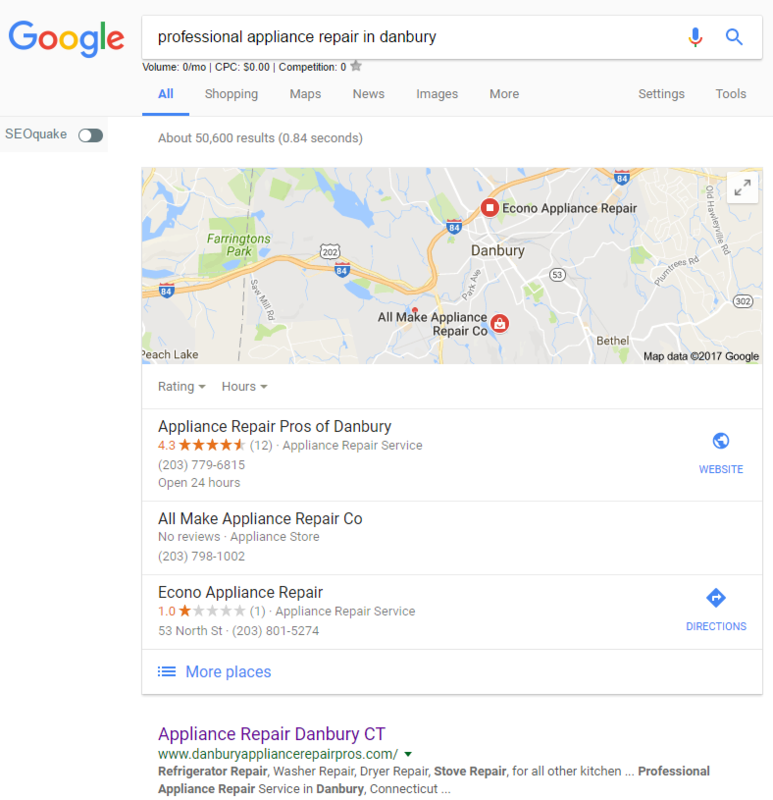 In this SEO Case Study we'll be showing you exactly how Search Engine Optimization impacted the Appliance Repair Pros of Danbury. Scroll down if you'd like the video version of this SEO Case Study... Don't worry we won't be offended! SEO takes time no matter if you're a local business or ranking nationally for e-commerce. In our SEO process we immediately go after "Long Tail Keywords" to scoop up leads in the first few months. 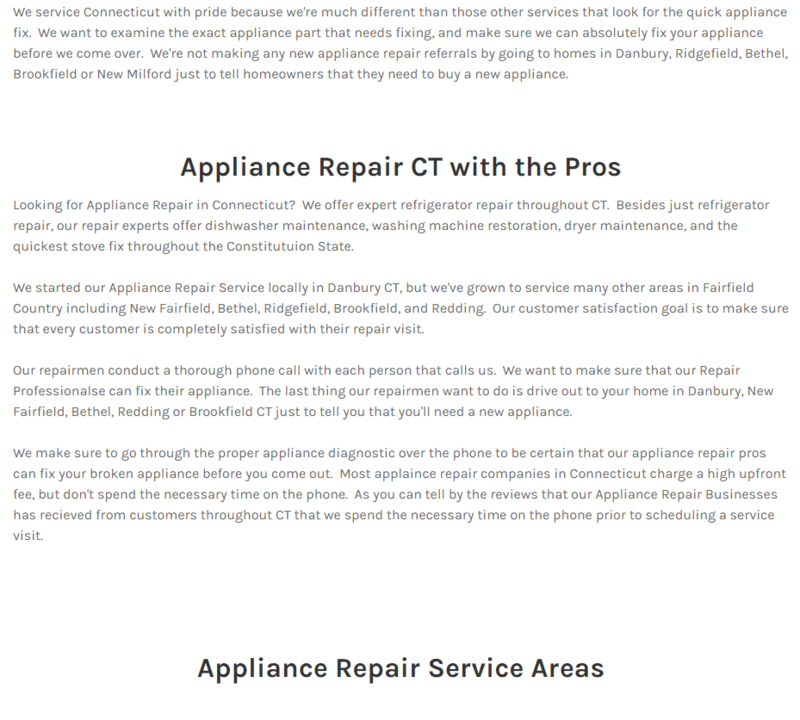 Phrases used by buyers in Google which are rarely optimized for, example "affordable appliance repair danbury, CT" or "Professional Appliance Repair Service in Danbury". 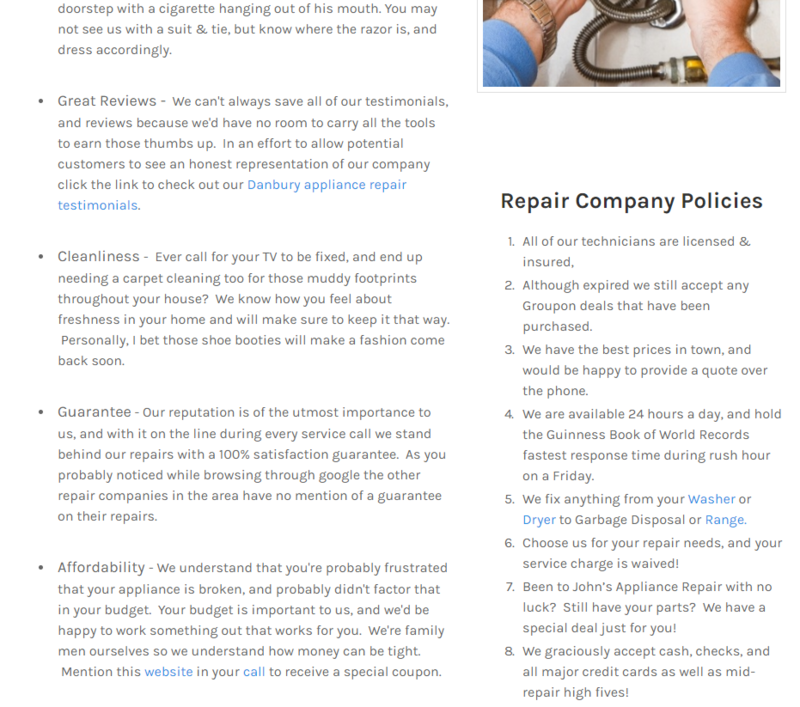 As you can by the long homepage there is a TON of content. The majority of people will make their decision within the first 45 seconds of landing on this page. The first sentence is optimized for Conversion and SEO. 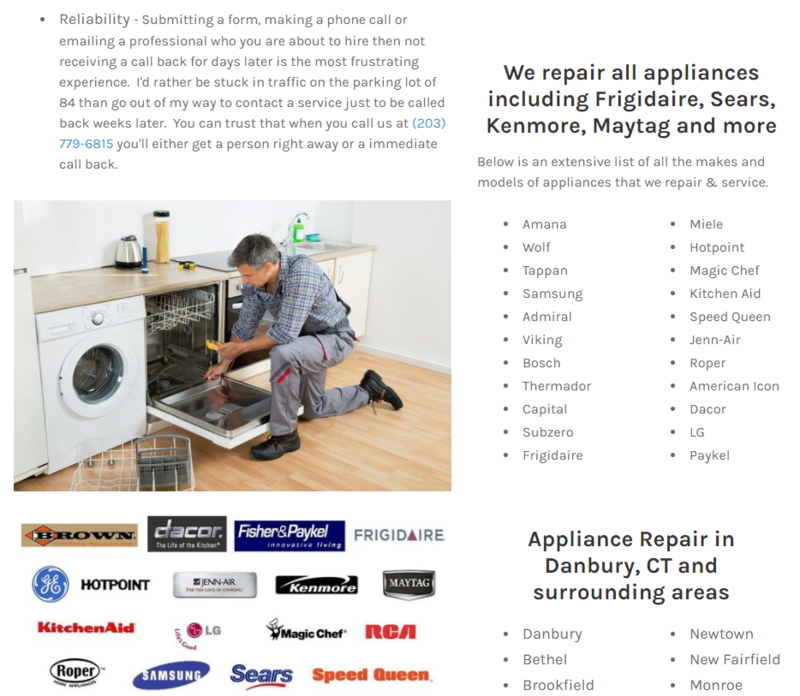 We concluded that most people with a suddenly broken appliance will be angry. Our content team used humor to blunt these feelings and put the user at ease. Our SEO Specialists also use a total of 1500 words of content on the homepage alone. Most of the Marketing Agencies use a mere 250 words of content in their website homepages. The local business owners are usually much worse with less than 100 words of content. Users visiting your website will rarely read all the content on your page, but google's robots sure will. Type in elephants in Google. You'll see Wikipedia pop up first with its 10,000 words about freaking elephants! The Question & Answer section further down the page is a great way to get those long tail keywords in the content without sounding like a robot. You'll also notice the plethora of pictures throughout the page. Each one of those pictures is saved as a keyword. Those pictures are named various keywords that might have been rather awkward or embarrassing to put into the website's content. Google's robots will read the picture as the name you saved provided you've changed the SEO alt text to match the selected keyword. Our SEO Specialists did very well at ranking this website on the SERPs (search engine results page). Unfortunately, in the last 2 years we've had this website producing leads we've switched our ranking tracking software up about 5 times. 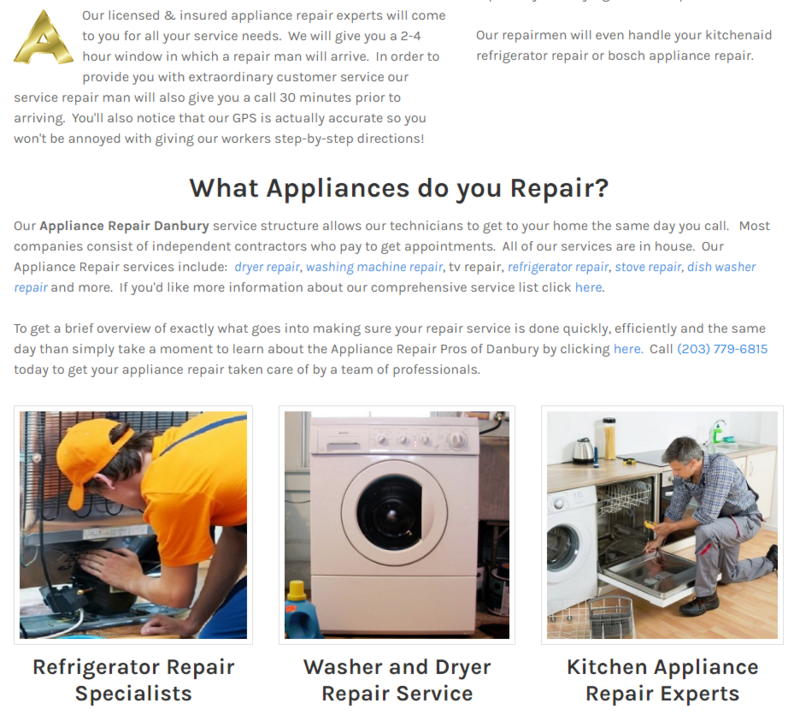 The Appliance Repair Pros rank well for their main keywords, and do very well in the map pack as well. 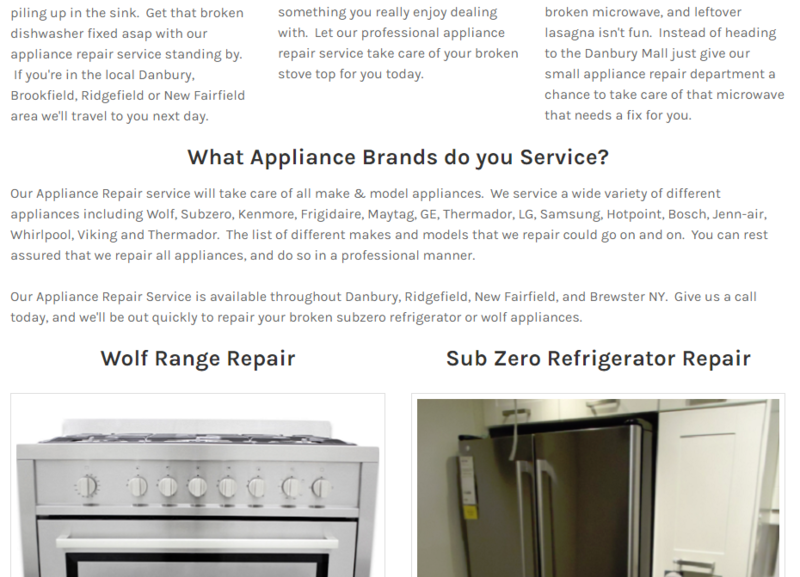 Our optimization specialists noticed that many people were searching for Appliance Repair Ridgefield, CT as well so we created an alternate homepage for that keyword. 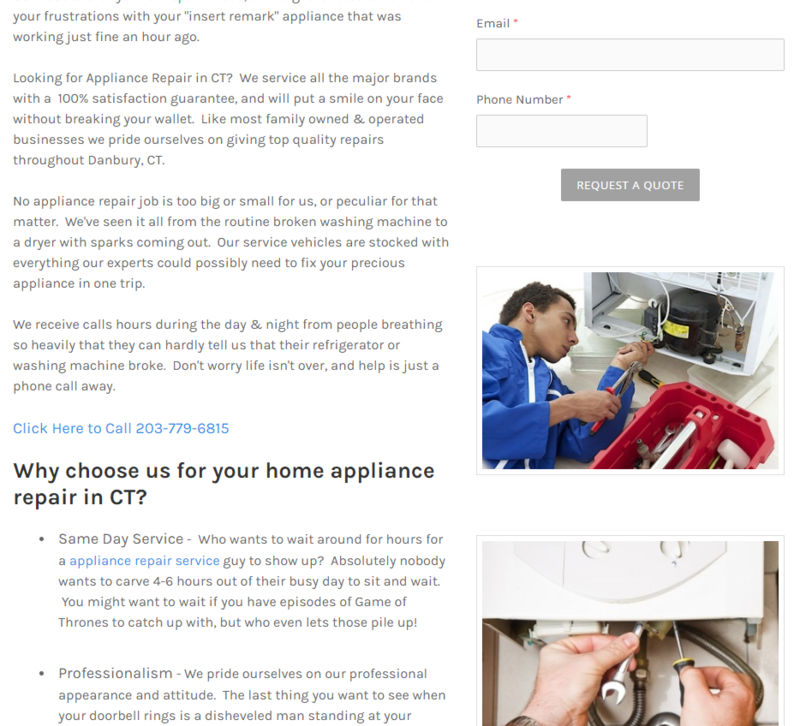 As you can our client's website is ranked in the second spot on the first page in another town. 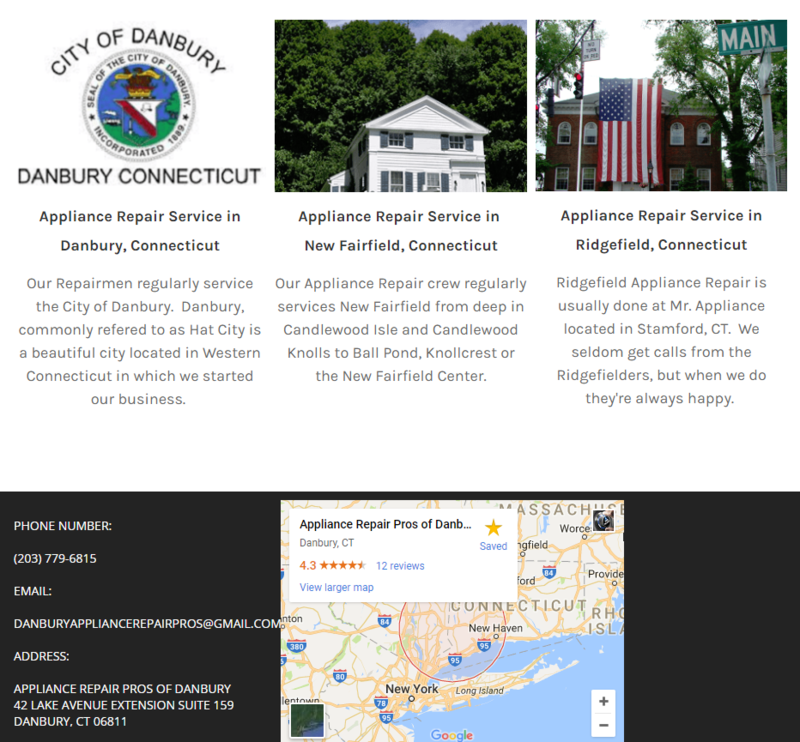 Our SEO Campaign also includes nearby towns including New Fairfield, Brookfield, and Redding. 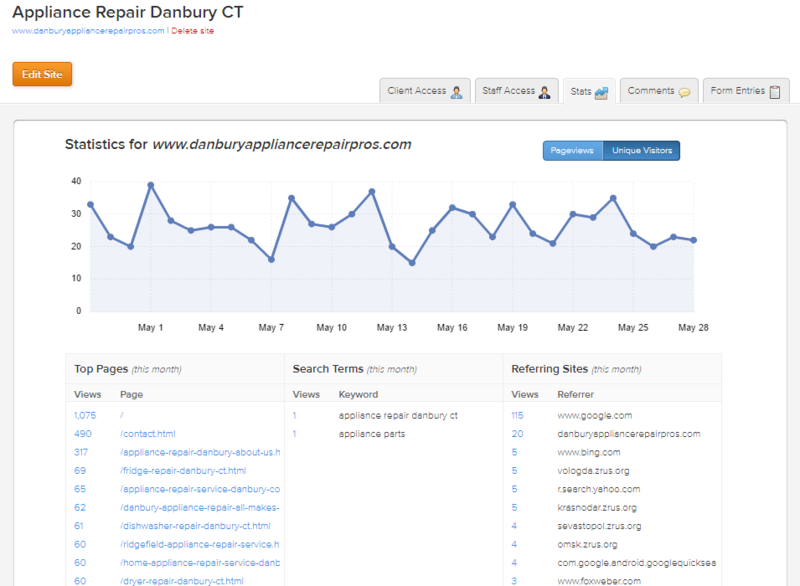 Most SEO Companies in Connecticut and across the country rarely do Keyword Volume Research. We have high tech tools available that let us know the exact number of searches done for each keyword! Will Power Marketing really focuses on getting our clients results no matter what they are paying us. We setup most of our deals to have a much lower starting SEO retainer than our competition because we're 100% certain we'll bring results to our customers. Before even considering taking on a new client or ranking a new website we make sure that it's a WIN / WIN for both of us. There needs to be an adequate return on investment for our clients to justify our SEO Service Pricing. Lets see the RESULTS of all that content, link building, optimizing, and more link building! Click the picture to enlarge. Notice there are 5+ pages (it's actually 6 pages) of calls generated int he last month. On May 19th there was a total of 15 calls. If you look closely there are about 10% telemarketing calls which may sound like a lot, but it's very little in the grand scheme of things. 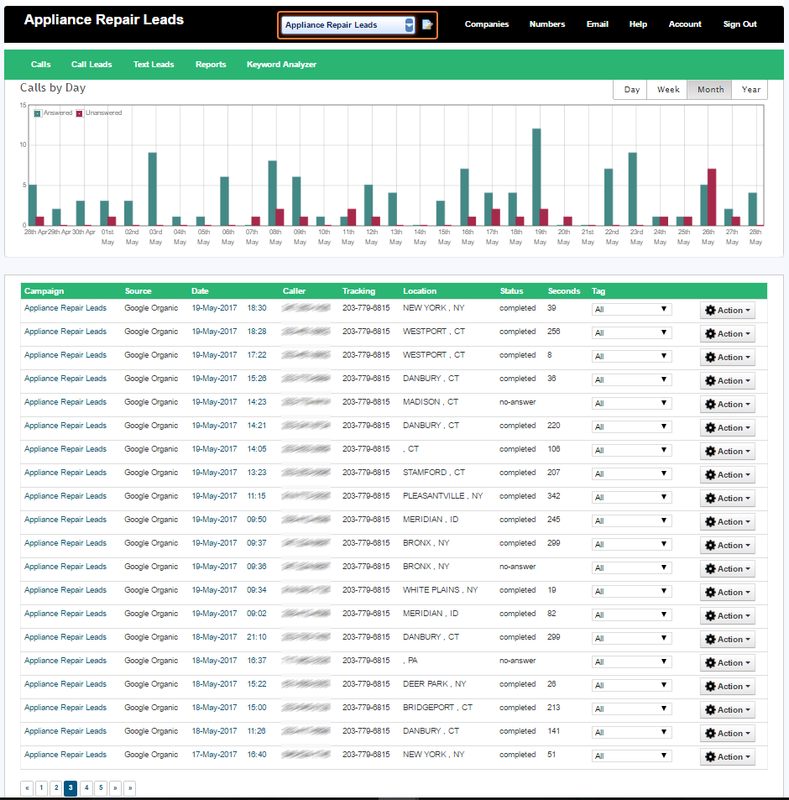 Our call tracking software blacklists callers daily to make sure you're only getting leads calling you. 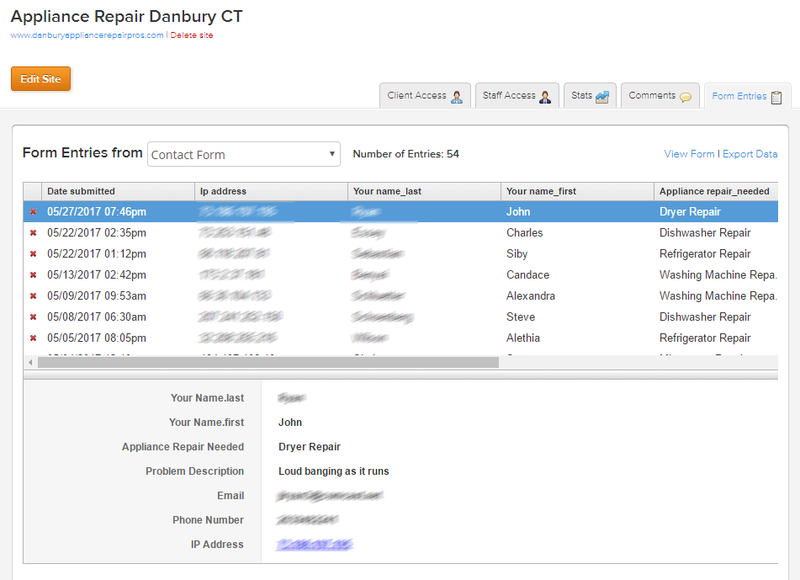 Getting calls are the best, but form fills are another big source of leads. 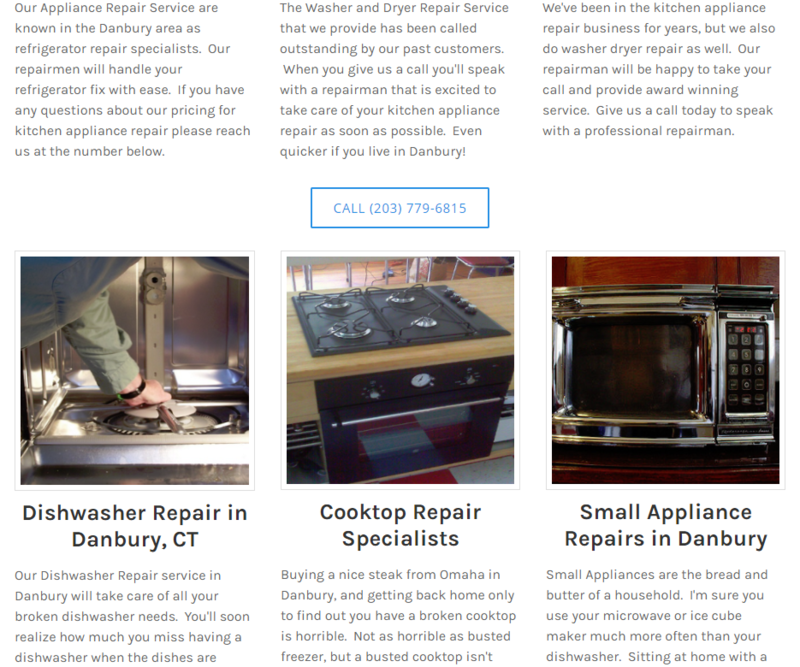 On this particular website we have a form on every page, and over email leads are received each month. Many local businesses and SEO Companies lose 100s of potential customers by not using forms! The proper Search Engine Optimization Campaign makes such a huge impact on a business. 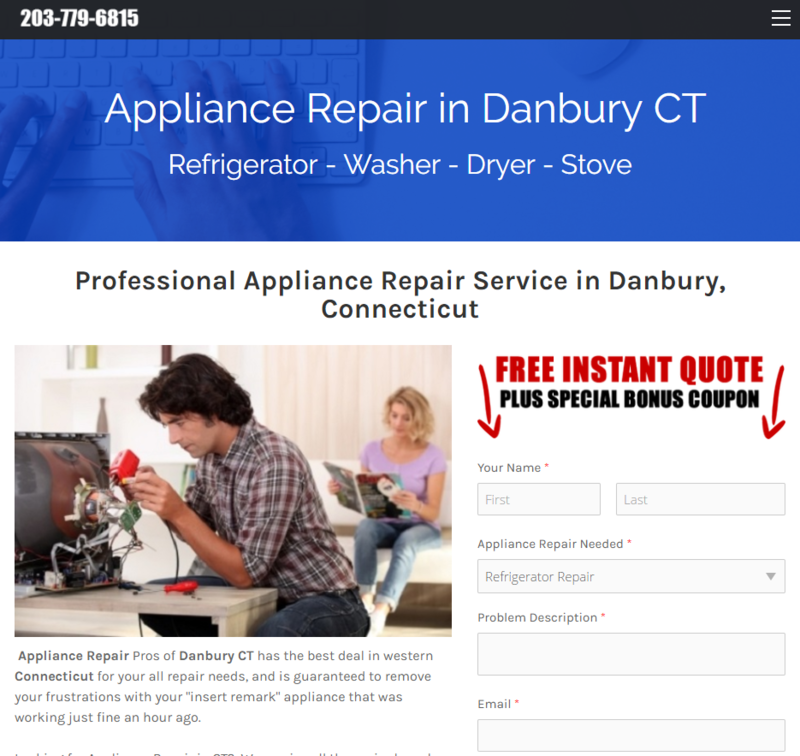 We've been able to generate over 100 leads consistently for months for the Appliance Repair Pros of Danbury. Everyday the website gets an average of 25 hits through Google Searches, Bing Searches and even Yahoo Searches. In the last 2 months we've seen a huge increase in exact match searches. 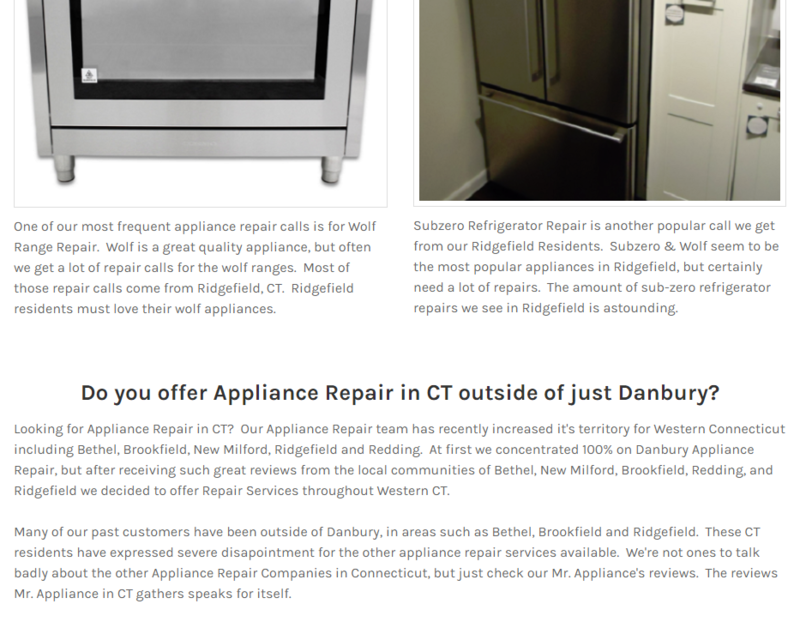 Exact match searches are people typing in "Danbury Appliance Repair Pros" which highlights the raw authority that is established by being glued to page 1. 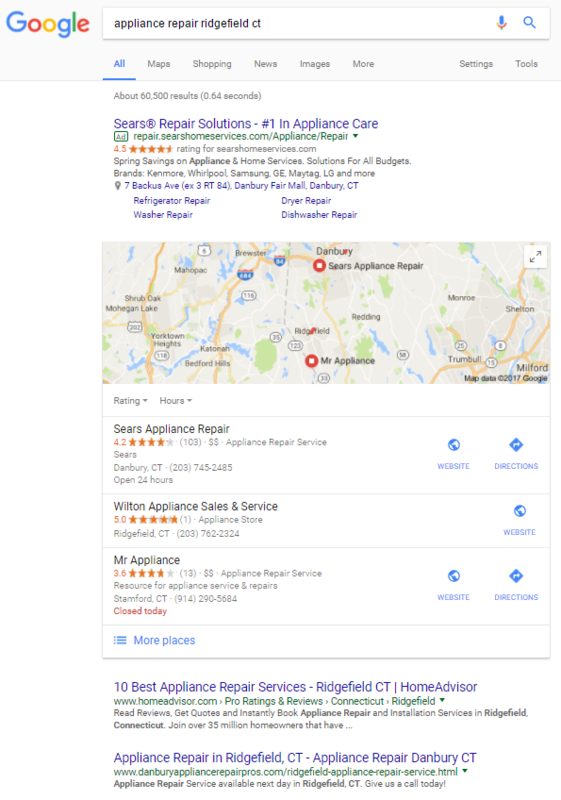 Interested in getting SEO Services for your local business? 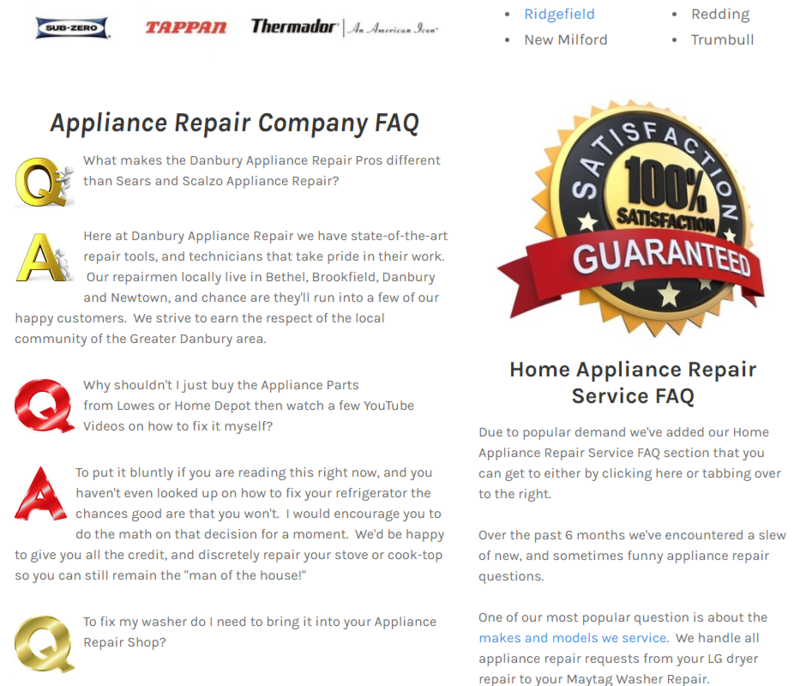 Give our experts a call at (203) 697-8227 today or fill out the form below! Tips & Tricks for improving your website, and beating your competition online. Will is very professional and knowledgeable in the marketing field. If you want your business to grow then he's your guy. I've seen amazing results with my business, and would recommend him to everyone... as long as you're not my competition! Will helped me grow my business tremendously in a matter of weeks. I literally had clients at my door knocking. I've never had that before! He offers expert SEO knowledge in his consulting packages which is unheard of in the world of internet marketing.